You are here: Home / Environment & Conservation / Polar peril? A UW Madison researcher played a role in the this week&apos;s decision by a federal agency, to list polar bears as a threatened species. UW Climatologist Eric DeWeaver used climate models to predict how global changes in coming decades will likely affect the Arctic, particularly with regard to summertime sea ice, a critical component of polar bear habitat. "Arctic sea ice is in decline," says DeWeaver. "It&apos;s declining at a rate of something like ten percent per decade. If you look at the year 2007 . . . there was just a spectacular loss of sea ice in September, an area the size of Texas and Alaska combined." DeWeaver says "it&apos;s kind of a no brainer" that a bear which spends its life on the ice will be adversely impacted by climate change, along with many other species. "The next question is really what to do about it," he says. "That&apos;s where the listing decision is really just kind of the beginning of a process. A lot has to be done yet, to figure out what we&apos;re going to do about this problem, and who&apos;s going to take responsibility for it." The U.S. Department of the Interior announced this week that the polar bear will be listed as a threatened species under the Endangered Species Act. 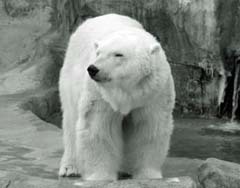 The listing decision was based in part on research conducted by DeWeaver and others on an international polar bear science team.